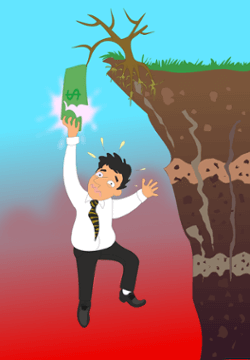 Is your business bleeding cash every month? Are you counting down the days until your company bank account hits $0.00? Or worse – you have no idea how long you actually have until that day arrives. As a business owner or entrepreneur, we all know how much we “should” be spending on a month-to-month basis. But in reality, things always end up differently than you foresaw. Unexpected expenses arise, costs come in higher than they should – things get out of hand at the blink of an eye. Before you know it, you’re miles beyond your company spending limit, and now you have to go to your board and explain where all your cash went! With a little bit of preparation and planning, your business can avoid this scenario entirely. Creating a company budget that fully encompasses all possible expenditures and accurately predicts your monthly limits is a much easier task than most businesses think. The hardest part is getting started, and if you are reading this then you have already completed that step! There are countless resources out there for creating company budgets. However, a surprising amount of businesses never take the time to create one, and consequently struggle to get a hold on their finances. Every business needs to have a detailed company budget lined up, however in the case of many early-stage startups, this becomes an even greater necessity. Since most startups aren’t likely to make money immediately, developing a plan for expenditures essentially becomes their entire financial road map for the first few months of operations leading up to revenues! Not to mention, defining expenses and predicting them into the future is essential for creating your financial model! If you are planning on raising money from investors at any point down the road, it is imperative to plan your spending with the utmost level of care and detail. In this article, I am going to take you through the exact steps to formulate a basic budget that you can operate your business around. We will dive into key concepts for laying out your future business expenditures, and incorporate those concepts directly into your budget. By the end of reading this, you will know exactly what your spend is going forward, and you will be able to accurately predict your future cash needs. Actually, there is one thing I do recommend before starting – begin formulating a more formal idea for how your company will derive it’s revenues (AKA make money). In order to create a longer-term budget, you are likely going to want to have a general idea for a revenue forecast in order to justify any increases in expenditures. Deciding on a revenue model and price for your product, and then creating a plan for growth are unavoidable factors in how your business will stay afloat, so it is important to start thinking about them ASAP! Check out some of those awesome resources if you haven’t yet, or keep on reading if your product is already on its way to making millions! 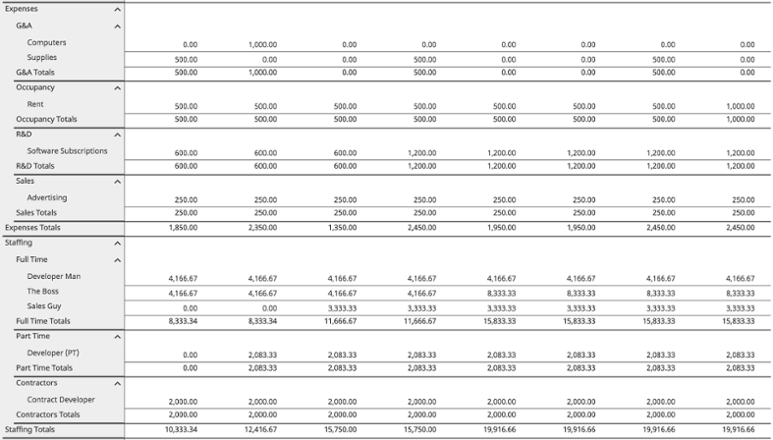 What Should I Use to Create My Company Budget? There are plenty of applications out there for setting up a detailed company budget, some good and some bad. Frankly, you can always use a spreadsheet to get started, however we do not particularly encourage this method, especially as time progresses and your budget becomes more and more complex and dynamic. At Hivemetric, our hearts lie in financial model creation. However, our application happens to be extremely fit for setting up a plan for costs and future expenses. If you think you will need a financial model down the road (you will), then I recommend checking us out. Either way, you can’t go too wrong with the method you decide upon as long as you take the necessary time and effort. The most important part is that you are getting started. What is My Business Spending Right Now? First thing’s first, you are going to need to know what you are spending right now. Hopefully you have been using a service like Quickbooks or Xero to track all of your bookkeeping needs. If that’s you, this step should come easy. However, I’ve consulted with a handful of entrepreneurs and small business owners, and in my experience I have learned a surprising majority of them do not have their past and current spending in order. Either way, you need to find your current monthly spend. If you are using some form of accounting software but haven’t been updating it, you’re in luck. You can still export a list of your total expenditures for the last few months as they have gone through your bank account, and from there you can distinguish which ones are important to keep as you set up your budget. If you haven’t been tracking your expenses, now is the time to start. Even if you are starting from scratch, make a list. It can be by hand, in a word document, or a spreadsheet. Whatever you choose, start listing off every monthly expense you can think of. Rent, employees, supplies, utilities, etc. – anything and everything, it’s ok if you miss a few things. The important part is to get everything down and together in one spot. Next, assign dollar values to each item for how much you have spent – if you are unsure of something then just pull up your latest monthly bank statement. Now you should have a list of your current monthly company expenditures, in some form or another. I know, it probably wasn’t the most thrilling activity to have to analyze all the money you blew through just to stay in business, but now the painful part is out of the way! Let’s move on to the fun stuff. We’ll begin our expense planning process with a top-down approach. We are going to first create categories for which you will classify your individual expenses under. You can think of your expense categories like the names of folders that you store documents in on your computer. 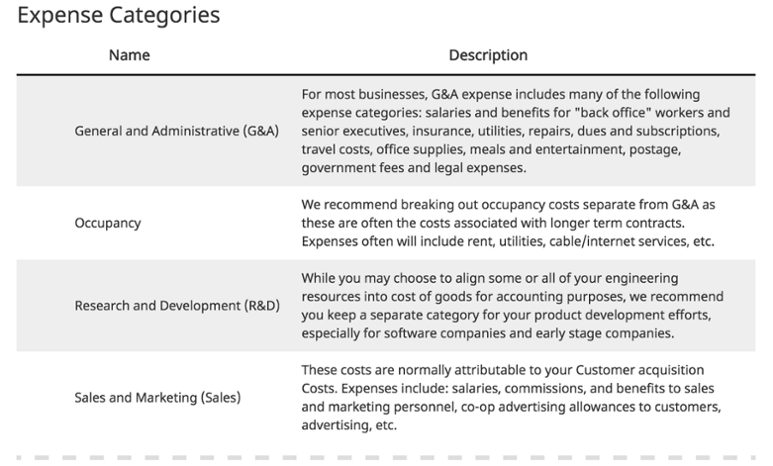 Your expense categories serve as an organizational tool to your budget. No one wants to look at every single expense item all jumbled together into one massive group – yikes! Part of creating an effective budget is in maintaining a certain level of organization and staying consistent to that organizational structure (It’s funny how the same saying remains for many aspects of financial modeling as well!). 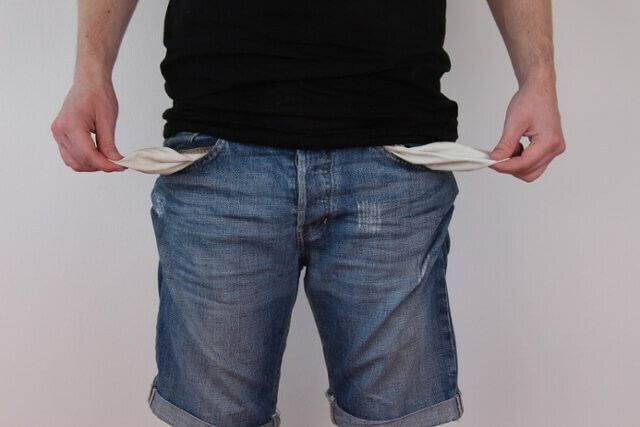 Once you have decided on your categories, it is generally a good idea to assign each one an allowance, or however much you want to spend in that specific category each month. It’s perfectly fine if you don’t know what amount you want to contribute to each category yet, just give a general dollar value or range and move on. By the end of setting up your budget, you will have a much clearer picture as to what you want each category to be worth. Now let’s go back to your list of past expenses you made a few steps ago. Line-by-line, expense-by-expense, go through and classify each item into the category which it best fits. For example, an expense on office supplies or new computers might fit under the category of “General & Administrative” or “G&A”. When it comes to categorizing staffing/employee expenses, there are generally two different ways you can choose. You can classify employees into the categories which you have already made. For example, a software developer might be thrown under “Research & Development”. OR, you can create an entirely separate category titled “Staffing”, and can then allocate the overall spending you wish to use towards employees in a single pool (recommended and easier). If you happen to have an expense that does not fit under any particular category (which will likely happen), simply create a “Miscellaneous” category. In fact, it is generally a good idea to create a miscellaneous category and fit it into your budget since it is pretty likely you will incur unexpected costs that you didn’t plan for. Now for the part where we get to start looking into the future. Well unfortunately, this future is the one where we plan your business’s costs going forward. Not very cool on paper, but hey, it will save you a lot of money down the line! Start by thinking into the next couple of months of operating your company. What expenses do you see during those months that aren’t on your current list? Maybe you are planning on purchasing new computers, or exploring a new marketing campaign in a different medium than you have before. Whatever it may be, add each future expense item to its corresponding category. Now, let’s think more long-term. I know it might be overwhelming, but try to imagine a whole year down the road. You might want to bring on another employee or two. Or maybe you want to purchase a company car (Please do not actually do this). Whatever it may be, add them to your budget. Anything you can imagine coming up, add it. Add it all. Here’s the fun part – drawing out your company budget for the months to come! 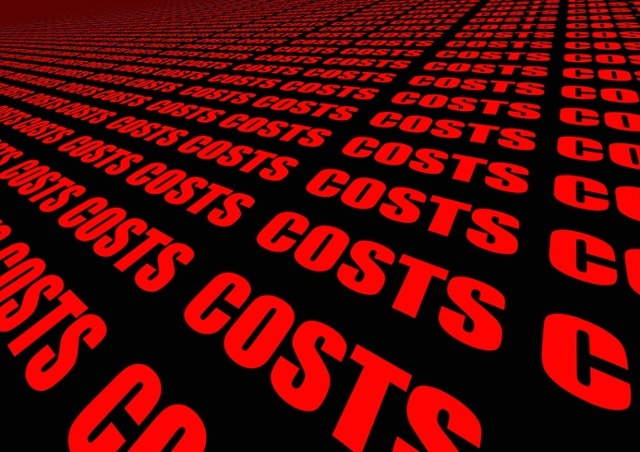 Before you get going, you should be sure to read up on some of the different types of costs that your business will incur if you haven’t already. Additionally, you should distinguish which costs will be recurring and which will be a one-time charge from your list of categorized expenses. This way you will know what to repeat each month and what to only account for during a single month period. At this point, if you have been using a spreadsheet, you are going to have to do this next part manually. If you are using Hivemetric, this part comes automatically – Lucky you! Let’s focus on a one year time frame for your budget, broken down into separate monthly periods. Whichever costs you have that recur each month, you will add to the next month going forward. Each cost that you anticipate will only happen once, add it under the month which it will occur. But what happens when you have costs that are charged on a quarterly basis, or perhaps bi-annually? Well, just add them to the month when they first occur, and then zero out that expense for 3 or 6 months until it happens again (Hivemetric automatically does this for you too!). Do this for each and every expense, both present and future, and then finally create totals for your expense categories over each monthly period, and a total calculation for all of your expenditures as a whole. 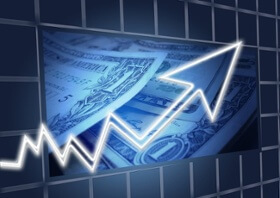 Next is to account for any changes in costs over the time frame of your budget. Let’s say you are anticipating moving into a pricier office space, or maybe you are going to give a worker a raise. Just like you’ve probably guessed, go through and work these changes into your projected budget. Congratulations! You have created a basic company budget for your expenditures for a whole year! But don’t you even think about stopping now – there are still a few essential items to consider before your budget can serve its intended purpose. So you’ve made a budget for the next year, but just think of how much better off your company would be if you could reduce that budget. That’s right, I’m talking about cutting unnecessary costs and actually saving your business money. Sounds great, right? Go over each expense again, and cut out any costs that aren’t absolutely vital in keeping your business operating at its full potential. Go through the applications you use on a daily basis, your spending on company meals and events, and think of where you might be able to reduce or cut spending. Chances are that you might have already identified a few unnecessary items earlier when you set up your original expense list. It might be sad to have to wave goodbye to some of those luxury items that were fixed into company expenses, however I guarantee you will be thankful you did so down the road! The last, and arguably most important step in preparing your new business budget, is to maintain and iterate upon what you have just created. The future is always changing, and so is your business. It’s OK if in a few months time, you need to add in additional expenses that you didn’t foresee from the beginning. It can and will happen! Also, be sure to track your actual spend against your budget each month. If your actuals are drastically different than your forecast, then make adjustments to your plan accordingly and keep moving forward. Your budget will never be exact, however if you take the time to track and adjust each month, eventually you will be surprised at how close your estimates really are! One thing I didn’t touch on was the topic of Product Costs (AKA Cost of Goods Sold), or expenses that are directly tied to revenues/products. In creating a traditional company budget, I generally like to only include items that you would find below the Gross Income line on your Income Statement or Profit/Loss Statement. This allows you to distinguish a budget that is entirely reliant on fixed costs, which are the most predictable in your business. But, if you want to include any Cost of Goods Sold items in your budget, that’s fine! Simply add an additional category for them. Just know that they will be harder to forecast unless your revenues are at a highly predictable level as well. I commend you if you have made it this far and have begun thinking/creating your budget as well. If you can grow into the habit of setting aside a small amount of time each month to update and fine-tune what you have laid out, I can guarantee you will save money in the long-run. Not only will you save yourself time and effort, but your investors, board, stakeholders, co-founders and employees will all thank you as well.